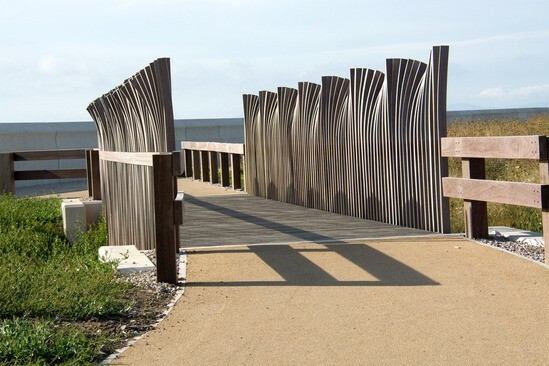 Artist Stephen Broadbent was responsible for the design of the Mythic Coast inspired park and the wave-effect bridge parapets were part of his concept for the scheme. CTS Bridge's structural engineers and in-house timber specialists worked closely with main contractor Balfour Beatty and Broadbent Studios to develop the concept into a buildable solution. 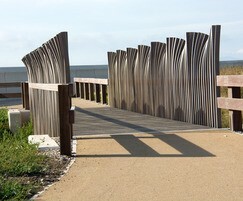 The final bridge designs use 12 unique spindles to create each 'wave' bay. The spindles are made from FSC ekki - a sustainably-sourced hardwood timber that is strong enough to permit the slender spindle sizes, whilst maintaining structural adequacy, and naturally very durable to suit the marine coastal environment. CTS Bridges Hi-Grip Excel FSC ekki deck boards with non-slip inserts were used and fixed to the galvanised steel frame. All three bridges were fully assembled in CTS's Yorkshire factory before being craned into position on site under the supervision of CTS's installation team in a 2-day visit. The company's joiners followed, building complementary ekki parapet approaches to the bridges. All three bridges were delivered and installed on site in time for the opening of the Coastal Flood Defence Scheme carried out by Balfour Beatty for Wyre Council in partnership with the Environment Agency.